"Black Ops II will just be on the Wii U", Call of Duty: Black Ops 2 not releasing for the 3DS, DS, or Wii. Call of Duty: Black Ops 2 will be releasing on November 13th, and until now Activision has been quiet about the game releasing for the Nintendo Wii, DS, or 3DS. Call of Duty: Black Ops 2 has already been confirmed as a Wii U launch title, even pre-launch of sorts, and it will be available to purchase on November 13th. 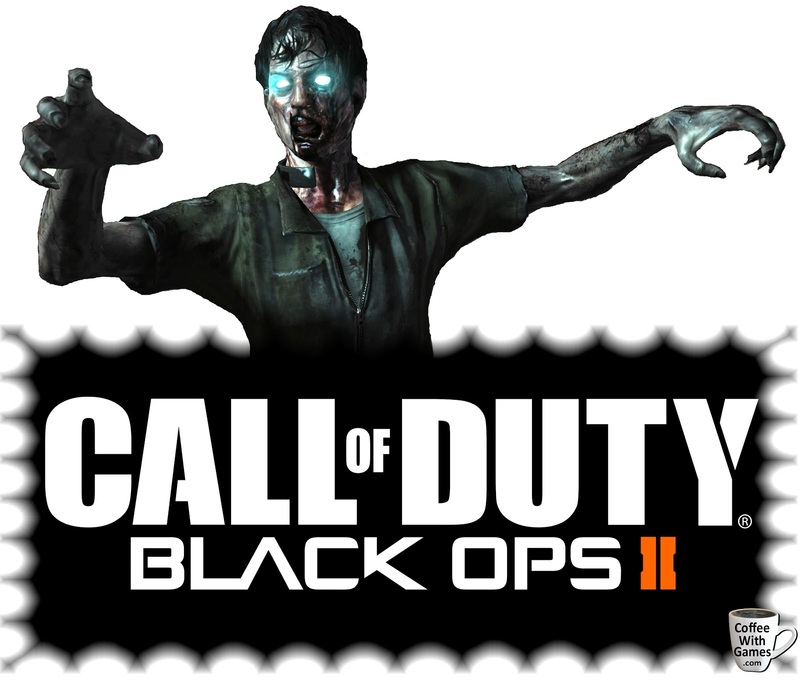 Will Call of Duty: Black Ops 2 release for the Wii, DS, or 3DS this year? Brew yourself some coffee, and hit the jump for a quick Call of Duty games history on the Nintendo DS and Wii, as well as the answers! The House of the Dead 2 & 3 Return released for the Nintendo Wii on March 11, 2008. The game was published by Sega, and it received an ESRB rating of "MATURE" with "Blood and Gore, Violence" listed as content for gamers and parents to be aware of. How many hours of gameplay can you expect battling the undead in The House of the Dead 2 & 3 Return if you haven't played it? How many U.S. Wii owners have reported playing the game, and how many hours have they reported playing it since the game released over 4 years ago? Brew yourself some coffee, and let's take a look! The Walking Dead to Wii U? Walkers don't talk, neither does Telltale Games? Somebody, or THING, needs some coffee. The Walking Dead episodic games series by Telltale Games is currently available for PC/MAC owners, PlayStation 3 owners, Xbox 360 owners, and iPhone/iPad owners. 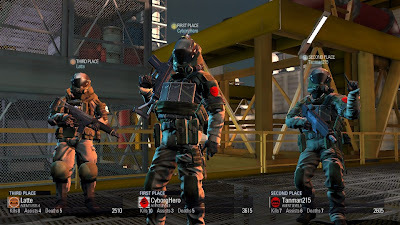 The series currently has four episodes available to play, and Episode 5 is scheduled for release in December. After seeing the first two seasons of The Walking Dead on Netflix and finding it interesting, I contacted Telltale Games about the possibility of The Walking Dead episodic games series releasing for the Wii U, since I have the system reserved and because they do have a history of developing an episodic games series on a Nintendo platform. No answer is usually an answer, but in this situation I have no clue what that answer might be. Maybe my questions weren't clear enough? I know walkers don't talk, at least that's what I have heard, but apparently from my email communications neither does Telltale Games. Brew yourself some coffee, and hit the jump to see my questions emailed to Telltale Games. Call of Duty: Black Ops II will soon land at retailers nation-wide and be available to purchase on November 13th. Treyarch and Activision are busy getting Black Ops II ready for launch, and like last year's release of a live-action trailer for Modern Warfare 3, that has now been followed up with today's release of a live-action trailer for Black Ops II. Brew yourself some coffee, and enjoy the trailer (a few times)! *NOTE! Apparently the beans spilled out of the bag too soon, and someone released the trailer earlier than it was supposed to be release! Coming from a follow up email, "The explosive :60 second high-octane piece, titled 'Surprise,' will be unveiled on network television in the U.S. tonight on Monday Night Football and will rollout worldwide across high-profile telecasts including elite European football matches." 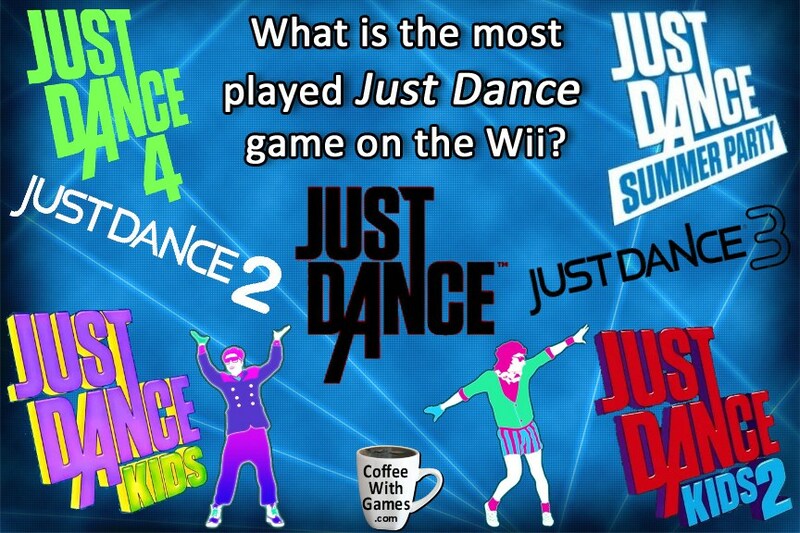 Do you still have questions about the features and functionality of the Wii U? There is now less than a month (21 days left, as of today!) before US shoppers can grab the Wii U from store shelves, and run home to play it. Nintendo of America just had another Nintendo Direct conference this week, on Thursday, that detailed games for the Nintendo 3DS system, but it provided no new information about the Wii U system or games for US consumers. How does Miiverse work? What about the Wii U's eShop games and details? Does the Wii U video chat feature function like the Wii Speak Channel? 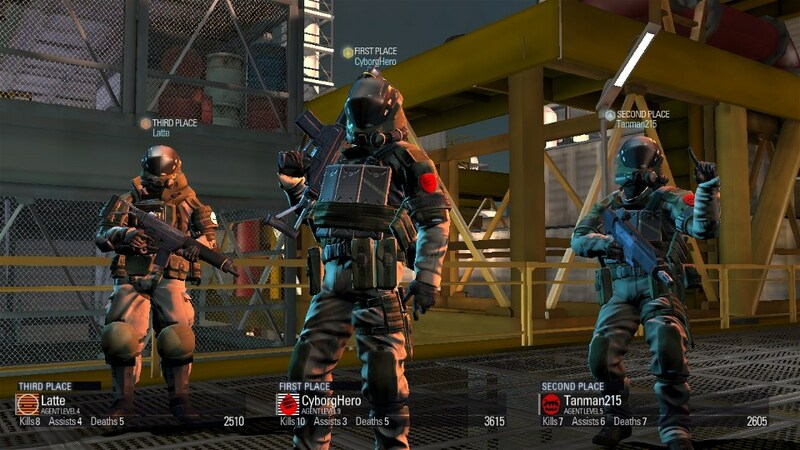 How about Wii U online multiplayer details? Will every Wii U system feature and functionality we know about be ready when the system launches? These may be some questions about the Wii U you're wondering about, as I am myself. Brew yourself some coffee, and hit the jump to listen to Nintendo of America's Bill Trinen's statement about Miiverse being covered in "more detail", and Nintendo of America's EVP of Sales & Marketing Scott Moffitt's response about the Wii U having all features and functionality "right at launch"! 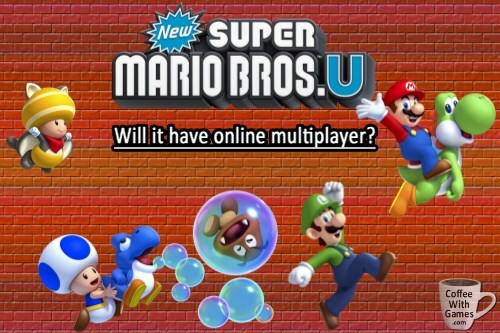 New Super Mario Bros. U to have online multiplayer? "Online Interactions Not Rated..."
Will New Super Mario Bros. U have some form of online multiplayer? New Super Mario Bros. U will be releasing with the Wii U on November 18th, just over a month away now. Nintendo has not really detailed the Wii U's online features, and hasn't even really confirmed which Wii U launch games will feature any sort of online multiplayer, yet. We do know New Super Mario Bros. U and Nintendo Land, both Wii U launch titles, have Miiverse functionality; but Miiverse details have not been fully discussed by Nintendo either. At the Wii U Preview on September 13th, Nintendo showed off two new game modes in New Super Mario Bros. U for the first time, those being the Boost Rush Mode and Challenge Mode. So, Nintendo had kept two new modes in New Super Mario Bros. U under wraps until the Wii U event, and nothing was said if either of those modes would have an online multiplayer function. Why do I think New Super Mario Bros. U might have a form of online multiplayer, outside of just Miiverse communication? Brew yourself some coffee, and let's take a look! Why did Nintendo stop publishing and shipping Wario Land: Shake It! as I reported in January 2010, and why isn't the game a Wii Nintendo Selects title yet? Is it because Nintendo thinks the "W" is misprinted upside-down in the title? If the game was, "Mario Land: Shake It! ", would it be a Nintendo Selects title already? Wario Land: Shake It! was released for the Wii on September 22, 2008 in the U.S., and was developed by GOOD-FEEL and published by Nintendo. The game released with a MSRP of $49.99, and it received an ESRB rating of "Everyone" with "Comic Mischief, Mild Cartoon Violence" listed as content for gamers and parents to be aware of. 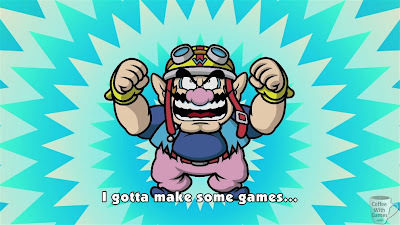 How many U.S. Wii owners have reported playing Wario Land: Shake It!, and how many hours have they reported playing it? Brew yourself some coffee, and let's take a look! Coffee Bean Counting: Which Wii U digital title(s) are you interested in? Another Coffee Bean Counting poll was posted last week, and has now closed. While Nintendo has shown and detailed many of the Wii U's retail games, and we know the MSRPs on most of them, there isn't a lot of information on the Wii U's digital titles. We don't know specific release dates for any of them yet, though some developers have said launch day is what they're trying for; and more importantly (to me anyway) we don't know the prices of the Wii U's digital titles yet. Hopefully, Nintendo will be answering here soon exactly what digital titles will be available to purchase when the Wii U launches on November 18th here in the U.S., and what prices new Wii U owners can expect to pay for the games. Knowing what the Wii U digital titles will cost me, will probably effect my buying decisions with other Wii U accessories, and even other Wii U retail games. So, which Wii U digital game had the most votes in the poll that started last week, and which titles did I select? Brew yourself some coffee, and take a look! The poll ran from Wednesday, October 3, 2012 through Wednesday, October 10, 2012. 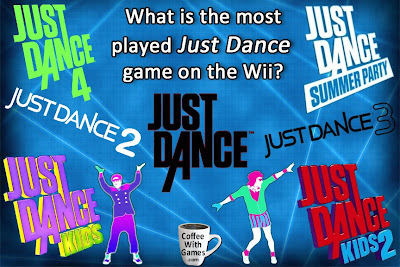 The poll question and available answers to select from can be seen below (also in the main Wii U GamePad image above). Which Wii U digital title(s) are you interested in? I was surprised by the results. I had never heard of Trine 2 that I can recall, until I saw it at E3 this year. I wasn't sure how popular the Trine games were, so I wasn't expecting it to place first in the poll. What Wii U digital game(s) were on my short list of placing first? I thought Little Inferno, Mutant Mudds, or Runner2 would get the most votes. The reason I thought this is because Little Inferno is being developed by Tomorrow Corporation, which consists of the guys behind World of Goo. I thought Mutant Mudds would be higher due to Renegade Kid's solid support of the Nintendo DS and 3DS, and the fact that Mutant Mudds is a solid, if challenging, platforming title. As for Runner2, it is being developed as a sequel to BIT.TRIP RUNNER and by the same team, so I thought perhaps it might get more votes as well. So, I was basically thinking that games from developers that have a history of working with Nintendo were going to do well. Again, I just didn't expect the one game I hadn't heard of before E3, Trine 2: Director's Cut, from a developer I didn't really know, Frozenbyte, to do so well; but that's not a bad thing! As for which Wii U digital titles I voted for, I selected all of them. Yes, you could do that! 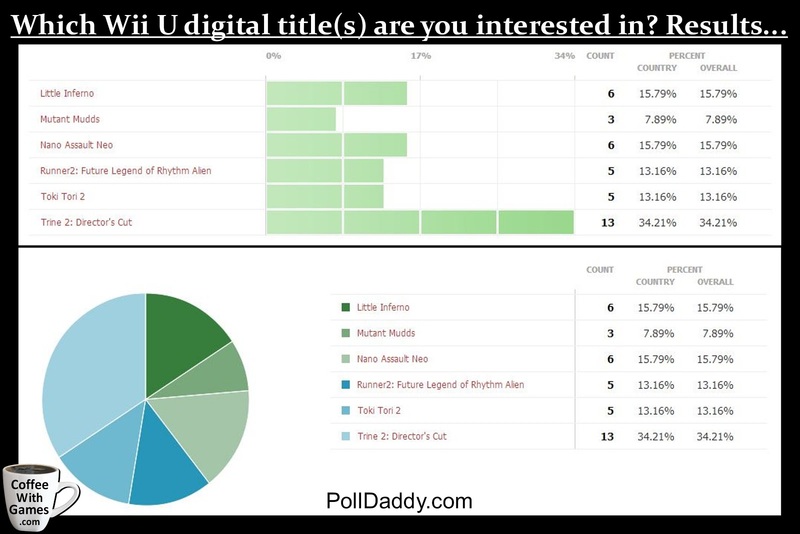 It was an honest vote though, as I really think the Wii U digital titles we know about right now, all seem to provide something different from the others (at least from what I can tell), which I think is awesome. Are there any Wii U digital titles that have been announced, that perhaps I didn't include in the poll, that you are really interested in? Are you ready for Game & Wario on the Wii U? Before looking forward, we're looking back! WarioWare: Smooth Moves released for the Wii on January 15, 2007 with a MSRP around $49.99. The game was developed by Nintendo's Intelligent Systems, and received an ESRB rating of "Everyone 10+" with "Crude Humor, Mild Cartoon Violence" listed as content for games and parents to be aware of. The game features "more than 200 lightning-quick microgames", and its "Game Type" is listed as "Mass Microgrames" from Nintendo via the press page. How many U.S. Wii owners have reported playing the craziness that is WarioWare: Smooth Moves, and how many hours have they reported playing it? Brew yourself some coffee, and let's take a look! Last week, as has happened every year for my entire life on the same day, I turned another year older. Crazy, I know. 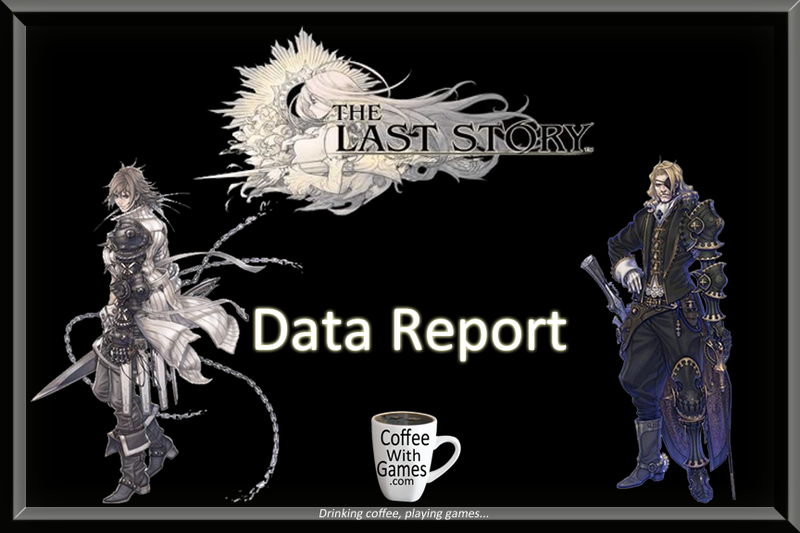 Last week, on my "September Brewed - Coffees Consumed, Games Played!" post, SOMEBODY attempted to spill the beans about my birthday in the comments. FYI, I know who you are, and where you sleep! So, what items did I get for my birthday last week? Brew yourself some coffee (if you haven't already), and take a look below (picture included for skimmers)! 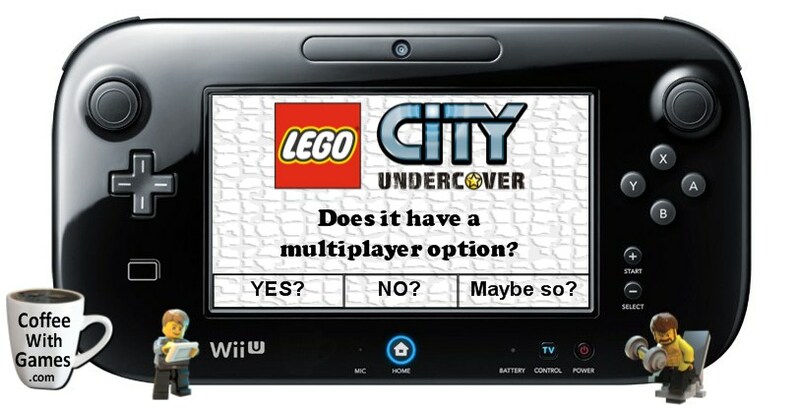 Nintendo says no, then yes, now no AGAIN on LEGO City: Undercover's multiplayer feature. Does LEGO City: Undercover have a multiplayer option? About 2 weeks ago now, I posted how Nintendo representatives had been back and forth on LEGO City: Undercover having some form of multiplayer, because the fact sheet for the game showed, "Players: 1-2", while the official page for the game showed, "No. of Players: 1". I waited patiently on responses from Nintendo representatives, and Jeremy, from NintendoFuse.com, even offered to send an email asking for clarification. We both received two different responses though. The response Jeremy received basically said that LEGO City: Undercover does not have a multiplayer feature. The response I received, a few days after his, told me to refer to the fact sheet for the game which said, "Players: 1-2". After receiving the two responses, I posted up the "Grounds for Celebration! Award - LEGO City: Undercover" and "LEGO City: Undercover to feature multiplayer? Nintendo says no, then yes?" posts that covered the issue and responses. Well, I received another response a few days after those posts, and apparently the first response was the right one? Brew yourself some coffee, and take a look at the timeline of responses below, as well as another mention of multiplayer in the game from somebody that played it at E3 this year! Should you judge a book game by its cover? Can a video game's box art help sell it? I have a friend that loves wolves, almost anything to do with wolves. Right after he purchased a Wii he was in Game Stop looking around, when he noticed a white wolf on a game box. The game was Ōkami for the Wii, and he left Game Stop with Ōkami because the box art caught his attention. Ōkami was originally released for the PlayStation 2, and originally developed by Clover Studio (now closed) and published by Capcom. The game was updated with Wii motion controls, and released for the Wii in North America on April 15, 2008. Both the PlayStation 2 and Wii versions of Ōkami received an ESRB rating of "Teen" with "Blood and Gore, Crude Humor, Fantasy Violence, Suggestive Themes, Use of Alcohol and Tobacco" listed as content for games and parents to be aware of. If you're a PlayStation 3 owner and haven't played Ōkami yet, but are interested in the soon to be released PS3 version of the game, how many hours can you expect from it? Well, how many hours have U.S. Wii owners reported playing Ōkami and what is the average number of hours played "Per person"? Brew yourself some coffee, and let's take a look!